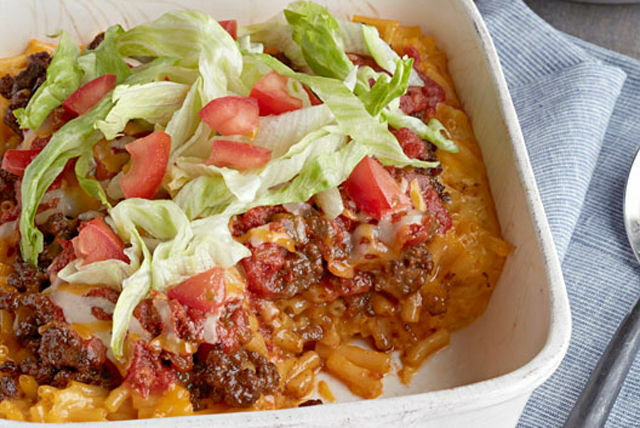 What'll it be tonight: cheesy macaroni or a taco bake? Choose both! This dish starts with KRAFT DINNER mac and cheese, making it a cinch to prepare. Prepare Kraft Dinner as directed on package. Meanwhile, cook meat with taco seasoning mix as directed on package. Add egg and 1 cup shredded cheese to prepared Kraft Dinner; mix well. Spoon into 8-inch square baking dish sprayed with cooking spray; cover with meat mixture, salsa and remaining shredded cheese. Top with shredded lettuce and chopped tomatoes just before serving.